Ealing Council’s cabinet has agreed to invest £4.6 million to improve roads and pavements across the borough in the coming year. 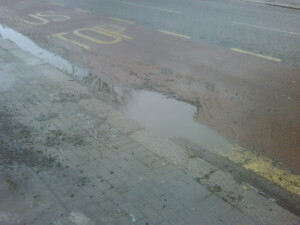 In addition, Transport for London has awarded Ealing Council £870,000 to spend on improving main roads in the borough. This brings the total spend on road and pavement resurfacing in Ealing to £5.5 million. A survey of all the roads and pavements in the borough is carried out every year. Only independent, accredited survey companies can carry out this work. Surveyors walk the entire length of the road network looking for defects such as potholes, cracking, wheel-track rutting and other signs of deterioration and damage. Each road is then given a condition rating on a scale of 1-100. Those with a low rating are considered to be in a good condition. Those with a high rating are judged to be in a poor condition and are targeted for resurfacing. The higher the rating, the sooner the works will take place. The survey takes place every year, because some roads degrade at a faster rate than others. Opposition councillors say Labour has spent £8million less than they did when they were in office and argue that over half the spending has gone to the Ealing North constituency. They say too many roads in Southall, Hanwell, Ealing, Acton and Southfield look terrible and are dangerous for cyclists and too many pavements are unsafe for pedestrians. The decision was made by the council’s cabinet on Tuesday, 25 March. All cabinet decisions are subject to call-in for a period of five working days from the date of publication of the minutes of the meeting. The full list of roads and footways scheduled for improvement in 2014/15 is available online here.